All the flavors you love in banana pudding come together in this Banana Pudding Poke Cake. 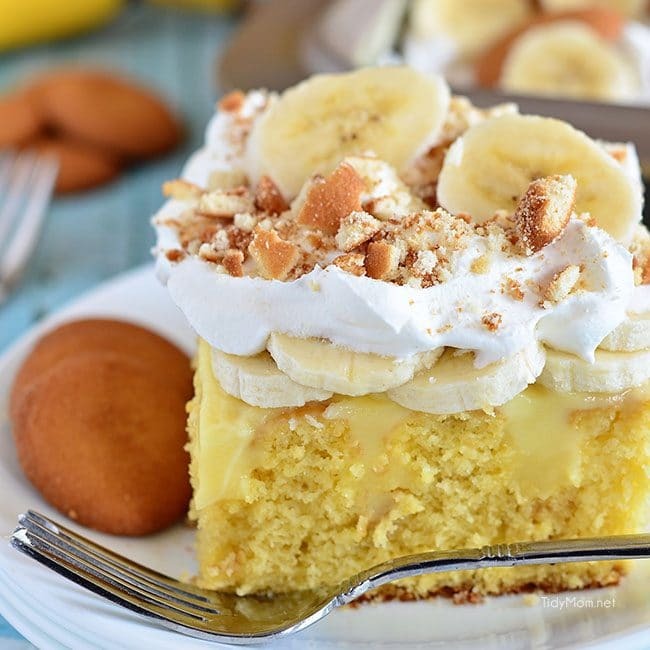 Trust me on this, this banana poke cake tastes every bit as good as it looks — it’s hard to go wrong with a nilla wafer banana pudding cake! I have a confession to make, I love anything with bananas in it! 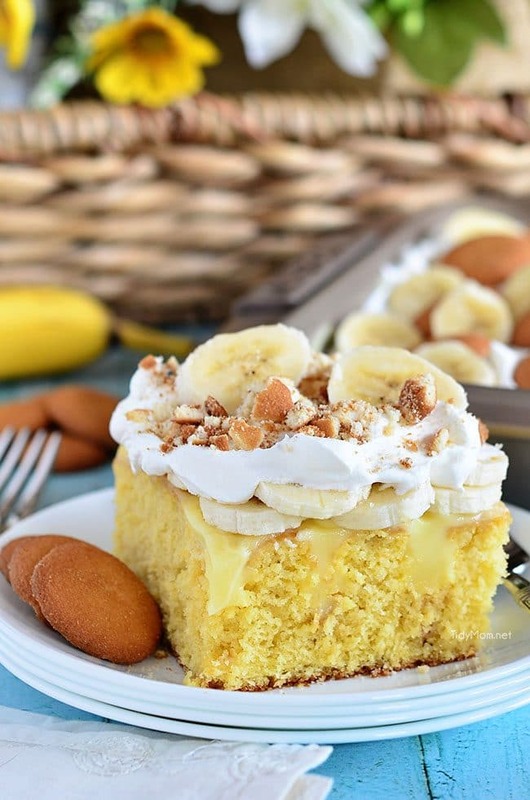 Banana pudding is no exception, and let me tell you, Banana Pudding Poke Cake…….WOW! This is a convenience kind of dessert (aren’t most poke cakes?). Jazz up a box cake mix with some bananas, instant pudding and frozen whipped topping (COOL-Whip) and BAM! Awesome cake! 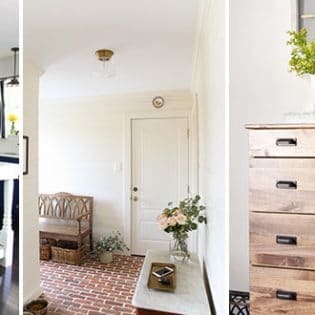 But if you are against semi-homemade desserts, you could certainly use your favorite yellow cake recipe, banana pudding recipe and make homemade whipped cream. I can only imagine how incredible THAT Banana Pudding Poke Cake would be!! 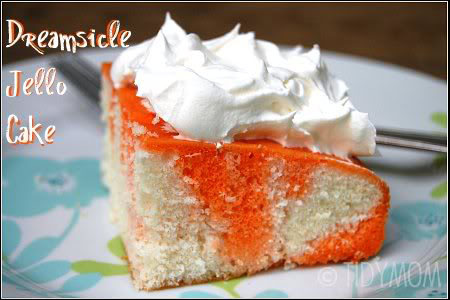 If you’ve never heard of a poke cake, you don’t know what you are missing! They have been around since the 1970’s thanks to the clever idea of Jell-O brand for an easy hip colorful dessert using a cake mix, Jell-O and Cool Whip. 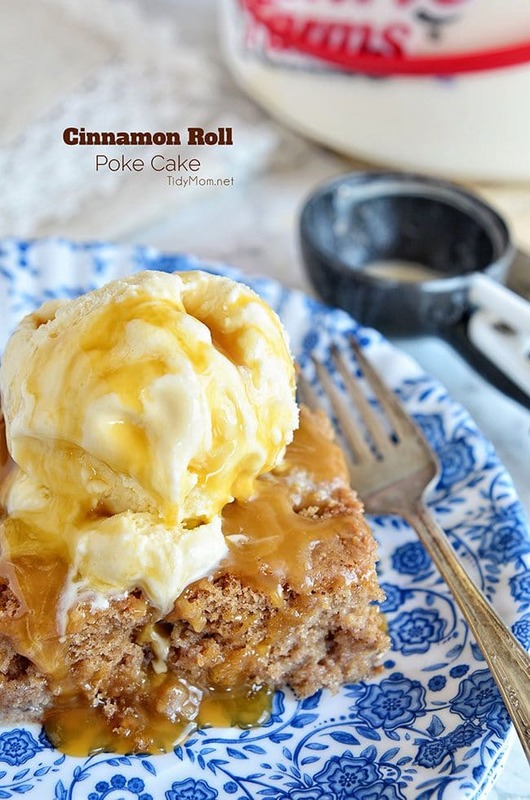 A poke cake is simply a freshly baked cake (from scratch or a box mix) poked full of holes (hence the name) with something sweet, creamy, or syrupy is poured over the cake to fill up the holes and infuse flavor and color to the cake. 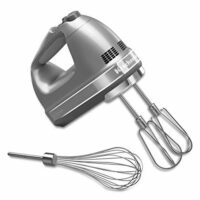 Traditionally, poke cakes are topped with whipped topping instead of cake frosting, so they’re usually refrigerated until serving. Making them the perfect warm weather dessert. Perfect for the busy housewife, poke cakes became a potluck and pool party staple. This no-fuss kind of dessert is baked, prepared, and served directly from a 9×13 pan! Today’s poke cakes have moved beyond the simple white and Jell-O gelatin. Red velvet, chocolate, banana, and lemon cakes are being poked and filled with everything from sweetened condensed milk, pudding or mousse to pastry cream, pureed fruit, and other delectable toppings. The flavor possibilities are endless. Literally, the easiest way to take an ordinary cake to a whole other level. 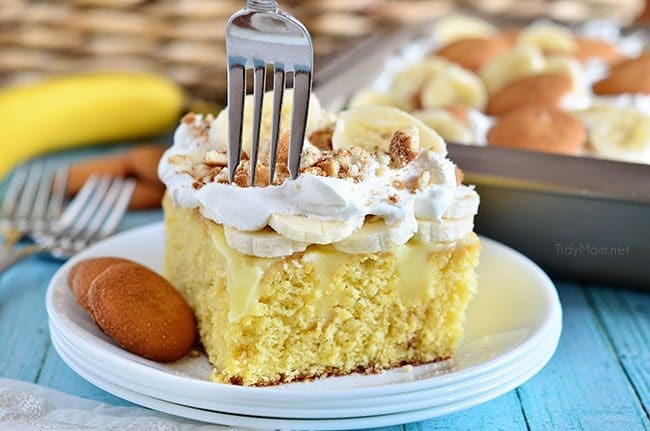 Banana Pudding Poke cake is best made ahead of time, but leave the toppings until you’re ready to serve, so the bananas look nice and the vanilla wafers are crunchy. I bake the cake, then let it cool for about 5 minutes, while I mix up the instant pudding; poke the cake, spread the pudding over the top, cover and refrigerate at least an hour (but a few hours or overnight is fine and even better). When I’m ready to serve, I top each piece with banana slices, whipped topping, and 1-2 crushed vanilla wafers – grab a fork and dig in! If you’re serving a crowd and anticipate most or all of the cake will be eaten, go ahead and top the whole cake – but just know, if you have leftovers, the bananas will get brown and the cookies will get soggy. We love poke cake. It really is an easy and delicious dessert that can be as extravagant or simple as you want. Either way, they are a perfect dessert to bring to a party! 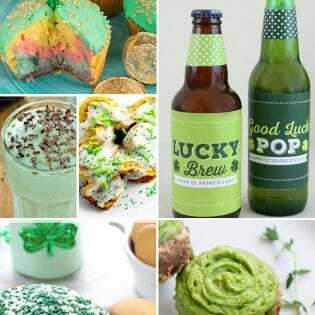 They can be made a day in advance and can serve a crowd—– if you’re willing to share 😉 I’m always expected to bring desserts to any party I attend. Poke cakes go a long way with my family and friends. 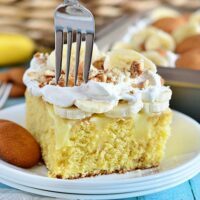 CHECK OUT HOW EASY THIS BANANA PUDDING POKE CAKE RECIPE IS TO MAKE! WATCH THE VIDEO! 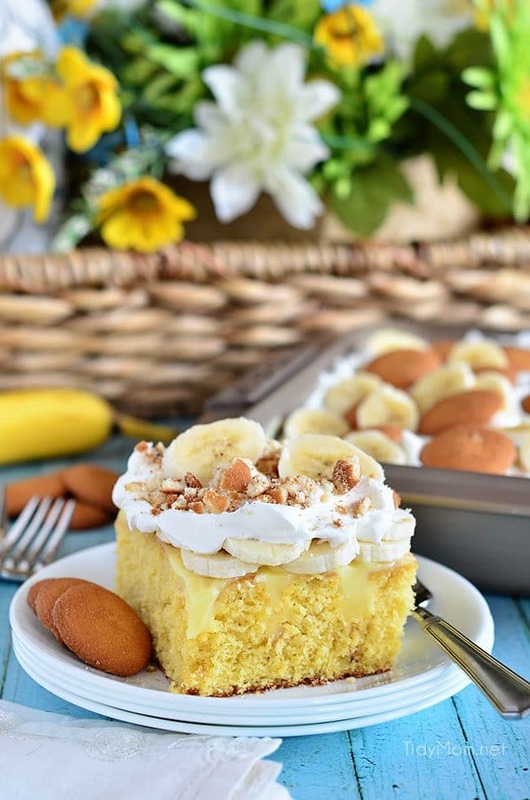 LIKE THIS BANANA PUDDING POKE CAKE RECIPE? PIN IT! Leave a comment below telling me about your favorite poke cake! 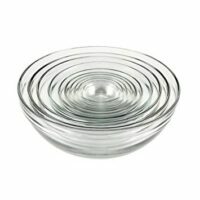 In large bowl, beat cake mix, water, oil, whole eggs and mashed bananas with electric mixer on low speed for 1 minute, then on medium speed 1 minute, scraping bowl as needed. Bake 38 to 42 minutes or until toothpick inserted in center comes out clean. Cool in pan on rack 5 minutes. While cake is cooling, whisk cold milk and pudding mix together in a medium bowl until pudding is soft and thickened, about 2 minutes. Using the handle of a clean wooden spoon, poke holes in cake, almost to bottom of pan, about every 1/2 inch. 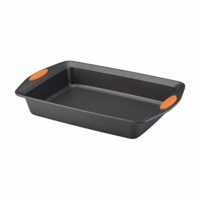 Pour pudding over cake immediately; spread evenly, working back and forth to fill holes. (Some filling will remain on top of cake.) Refrigerate at least 1 hour. Keep cold until serving. Then, top with sliced bananas, whipped topping and crushed vanilla wafers. It's best to place toppings on pieces being served, not the whole cake (unless you're serving the whole cake). Holy cow Cheryl!!!!!!!!!!!!!!! Looks UNREAL!!! I must make this. Poke cakes are the best because they are so EASY! This looks like no exception. Love the banana twist!! My son would LOVE this for his birthday! It looks So good! I make this but add 8 oz cream cheese mixed in banana pudding, add drained crushed pineapple over bananas. The citrus acid keeps the bananas from turning brown. Then sliced fresh strawberries, shredded coconut. I add 8 oz soft cream cheese & 2 packets of Splenda & fold it in the whipped cream. Sprinkle chopped walnuts over it. I will add the crushed vanilla wafers to it & poke the holes in the cake. I’ve poked holes in cake & add jello to it before. It’s also gets you great compliments. 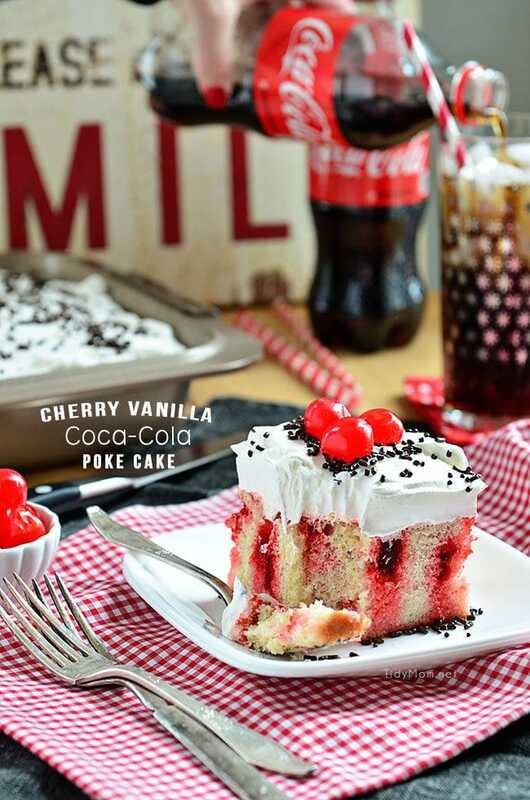 I am a first-time poke cake maker…usually, I would read through more recipes before diving in, but I got excited about this and jumped in…head first. There are essentially no directions about how many holes, how deep, what size holes. 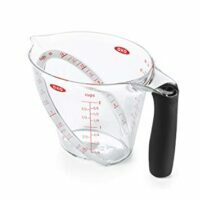 That’s not to mention that there is also no directions indicating that the pudding must be made AFTER the holes are poked and used promptly before setting. I essentially have a pudding mix on top of my cake….not at all what I wanted or intended. Ah well, you learn and try again I presume. 4. 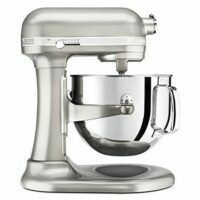 While cake is cooling, whisk cold milk and pudding mix together in a medium bowl until pudding is soft and thickened, about 2 minutes. 5. Using the handle of a clean wooden spoon, poke holes in cake, almost to bottom of pan, about every 1/2 inch. 6. Pour pudding over cake immediately; spread evenly, working back and forth to fill holes. (Some filling will remain on top of cake.) Refrigerate at least 1 hour. It also doesn’t say which size boxed pudding. I like your page ! What size boxed pudding and how many?1 or 2? Sounds yummy,can’t wait to try. Nice recipe everything I needed to know explained clearly. Making it right now for Thanksgiving tomorrow November 22, 2018. Thanks for sharing. Yum, this looks so delicious!! I can’t wait to make it. This is one of those desserts that disappears in a flash at my house! So good! This is the dream cake. I’m obsessed with any and all things banana, this is one cake we make all the time and cant get enough! Such delicious banana flavor! Love the crushed vanilla wafers on top! Yummmmmmm! I love a good poke cake!